A ladies St Helens climb on the day after Mother's Day. Paved all the way to the start of the trailhead located an the Marble Mtn Sno-park. No snow parking pass needed by 5/14. No other passes needed either. We decided to pamper ourselves and rented a cabin at Lone Fir Resort located in Cougar, WA which was about a half hour drive to the trailhead. All gathered for a nice dinner at the restaurant at 6:30pm. 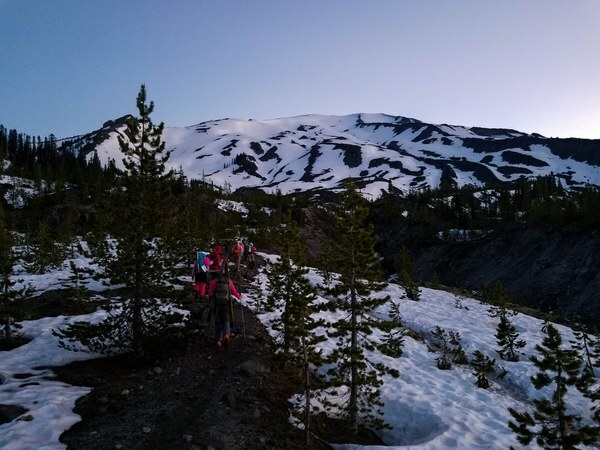 In our cars at 3am the next day and on the trail at 3:50am with headlamps on. We got an early start to avoid the predicted heat that was to come. But for now the morning weather was perfect, cool with a slight breeze which was so nice for hiking up the snowless trail. 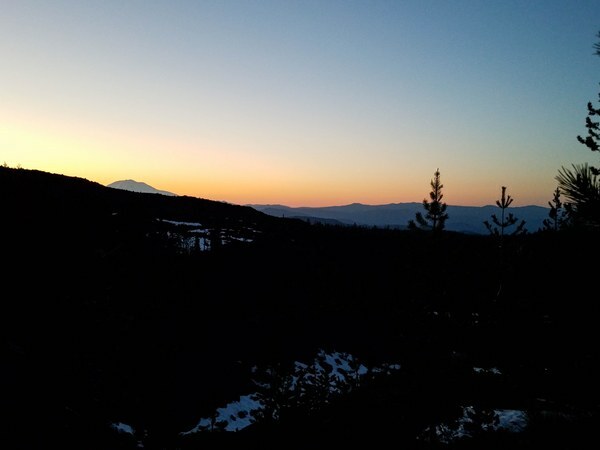 Dawn broke around 5am and we could see the the top of Mt Adams silhouette in the morning red. Soon our first glimpse of MSH also came into view. I am not sure at what elevation we hit continuous snow, but it was not far below the first weather station. The snow never froze from the night before so it was easy to kick step if the steps were not already there. 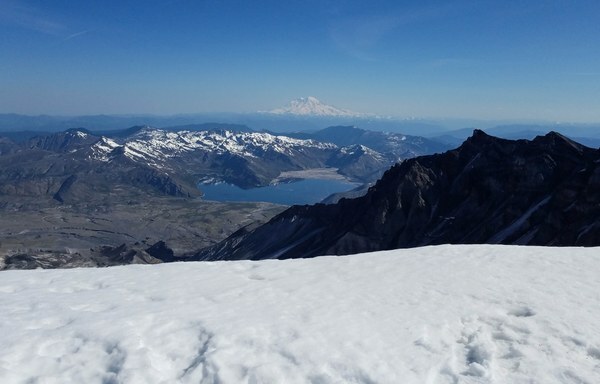 Our route was the Worm Flows Route, but at some point we angled climber's left and started up the Monitor Ridge Route a couple thousand feet from the summit. I guess we were pretty much following the few people ahead and the beaten path. In the end it didn't much matter as there were lots of people going both ways. The breeze would pick up off and on during our entire climb. We stopped to re-group and/or have snacks 4-5 times and finally arrived at the summit around 9:30am. 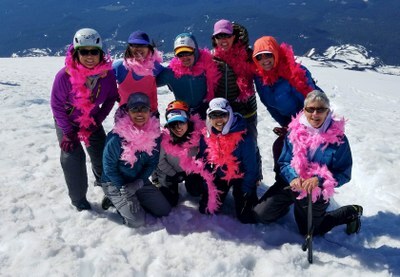 We pulled out our pink boas and with feathers flying, wrapped them around us quickly for a summit photo shot. 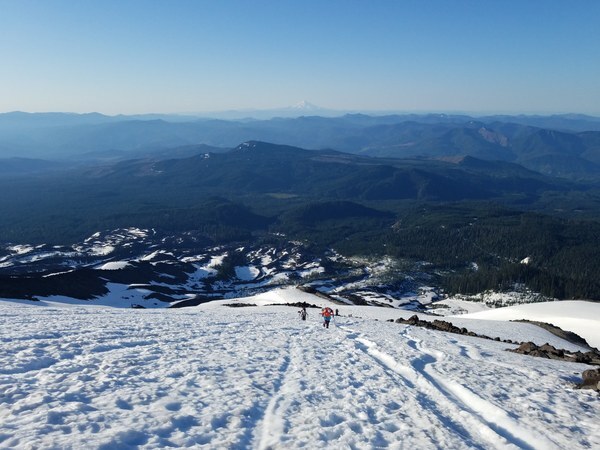 After about 1/2 hr we descended, glissading as often as possible (many with garbage bags.) Sharon had brought her skis and said the skiing on the upper slopes was good. As we reached the treeline, about 5000', it started getting really warm. Back at our car around 2pm. Out of the 9 people who went, 5 had climbed MSH before, many multiple times. The 4 who had not were Basic students in Patty and my SIG.